According to Matt Bush, it is easy to become so fixated on a goal that you forget to enjoy the journey along the way. As one of the world’s most accomplished free-solo climbers, his great passion is to indulge in the sensation of what is perhaps the most extreme of physical and mental journeys: rope-free climbing. Free-soloists exist at the extreme end of the climbing spectrum, eschewing the usual ropes and safety equipment and relying purely on their climbing ability. Bush’s initiation into the world of climbing began at age 17, when he completed his first climb at South Africa’s Table Mountain. Spurred by this early accomplishment, Bush took up the sport competitively, and swiftly garnered a reputation as a talented climber. Bush continued to pursue traditional climbing for about 10 years before he was enticed by the concept of ditching his safety equipment. Now aged 32, Bush has fully developed his niche, working his way to the forefront of the free-climbing community. Owing to his Capetonian roots, Bush has developed his style on sandstone rocks, which naturally occur with far more overhangs and complex formations than those climbed by most free-soloists. Perhaps this explains Bush’s reputation for taking on routes other soloists would typically avoid. His style, which he has described as “not reckless, but dynamic and explosive”, has been noted for pushing the limits of what is considered acceptable within the sport. One of his more impressive stunts is known as a ‘dyno’, or ‘dynamic leap’, a jump in which all four points of contact leave the rock. Business Destinations caught up with Matt Bush to talk about his career so far, and discover what drives him to pursue the most dangerous of climbing disciplines. What drew you to free-solo climbing? Free-solo climbing represents the ultimate challenge for me. It’s really the challenge of overcoming personal fear and the mountain that’s appealing. The feeling of moving freely and the connection to nature is a bonus. You have described climbing as your own form of creative expression – what do you mean by this? Climbing is more than a sport for me; it’s become a way of life and an art form. There are many ways to climb a mountain and, in that, there is creative expression. What do you say to people who think you are crazy to do what you do? Most who say what I do is crazy think that I take uncalculated risks; they have no understanding of the risk calculation involved. It’s a complex equation that involves many factors – is free-solo climbing more dangerous than driving a car? That depends on personal skill and ability, as well as the situation or circumstance. Am I scared of death? Yes, I experience a natural fear of death – it serves as a protective mechanism for survival. I train myself to achieve a free-solo climb, there’s no guesswork; I don’t play roulette with my life. With proper training and preparation I gain the skills to execute the action safely. Would you drive on a highway without training and preparation? No. Therefore, I don’t free-solo without a conscious consideration of the process involved. Is that crazy or sane? What skills do you need to be a free-climber? Free-climbing is an individualised activity. What’s important for one free-climber may not be important for another. So I cannot say there is a set of universal skills for free-climbing. I must also add that I neither promote nor endorse free-climbing. It will always be a personal experience. Do you think there is a certain life philosophy that free-climbers have in common? I think the life philosophies of soloists are diverse and varied. Perhaps there is a unifying common thread, something like: live your dreams, anything’s possible and don’t let fear stop you. That may be a common philosophy. Can you describe how it feels to be mid-climb without any equipment? Are you scared of death? Depending on my state of mind, I can either feel controlled and relaxed or gripped and fearful. That’s why it’s really important for me to have the right mental state for free-solo. Most of the time I am completely calm and focused. For the other times, I am just managing my fear. What has been your scariest moment when climbing? The most scared I have ever been was when I was attacked by jackal buzzards (predatory birds) while soloing. They were nesting on a nearby route, and I guess they thought I was trying to attack their young. They dive-bombed me from both directions – I had to fight for my life mid-climb. Luckily, I had a sling and carabiner with me that I could use to defend myself. It was harrowing. I’ve experienced foot and handgrips breaking, as well as heavy winds,but this experience was by far the most fear-inducing. Have you ever fallen or had any close calls? If so, did it ever put you off climbing? I have fallen from about nine metres into sand. I have also experienced rock breaking, heavy winds and territorial birds as mentioned previously. These experiences could have been career-ending. However, I decided to focus on the positives and make them work for me. I am now far more calculated in my preparation. What has been your most memorable climb and why? 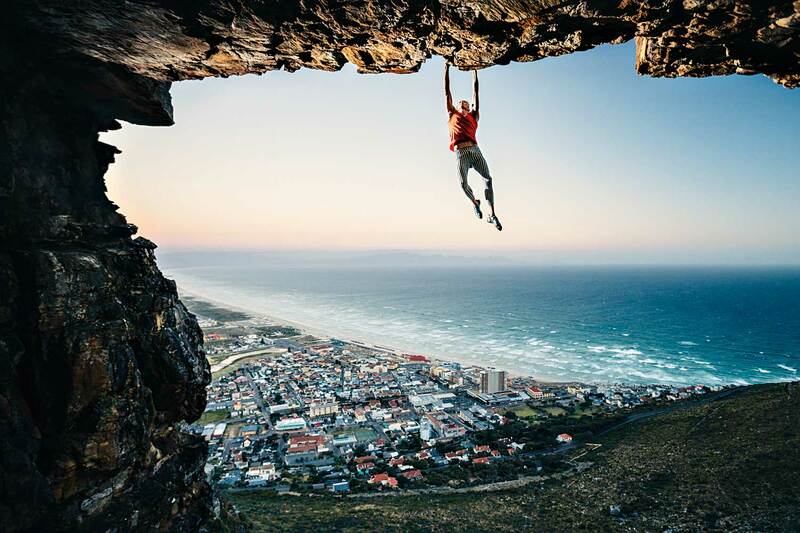 I’d have to say free-soloing a 10-metre horizontal roof called Cape Fear in Cape Town, South Africa. The climb itself is located in a spectacular setting above the ocean. I had prepared for a hang five manoeuvre – this involves swinging the feet free and holding a stationary position with one hand on the edge of the overhang. This particular manoeuvre was mentally very demanding. But when I achieved it, it was one of my most memorable moments.